ReveilleVIII is scheduled to retire after years of faithful service and training. Interim President at A&M sent this message today. Reveille VIII, who has faithfully served as the Texas A&M mascot, will formally retire following Final Review at the conclusion of the spring 2015 semester or upon selection of her successor. Until that time, she will continue to function in her current role as the First Lady of Aggieland. This decision was reached in consultation with her veterinarians at the College of Veterinary Medicine & Biomedical Sciences. Reveille VIII, who turns nine years old next spring, has participated in hundreds of athletic events, student programs and other activities since coming to campus in August 2008, and is most deserving of this time of rest and relaxation. Following her retirement, she will live and be cared for at the state-of-the-art Stevenson Companion Animal Life-Care Center on campus, where she will be able to interact with the Aggie community and where her physical, emotional and medical needs will be met by dedicated Texas A&M veterinarians and others. I have asked Tom Reber, interim vice president for student affairs, to chair a twelve-member selection committee to immediately begin an extensive nationwide effort to seek her successor. We will keep the campus community up to date as the search progresses. You may remember our September 2013 issue, which prominently featured the Aggieland First Lady herself on the cover. 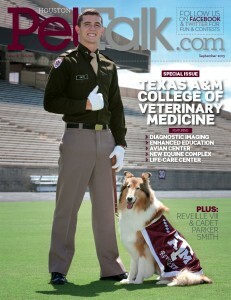 See page 24 for info on Texas A&M University, and the followup article on Reveille VIII on page 33.